A nerve gas attack has reportedly killed up to 1300 outside of Damascus. Initial reports are blaming the Syrian government: libertarian types are skeptical because political elites have been looking to provoke increased US involvement in Syria. It has not been above them to hype up and/or orchestrate events to promote new wars, and Barack Obama has generally been open to starting them. Regardless of who the perpetrator turns out to be, we have a Bloodbath Formula in the sky for the event. 1. Pluto opposite Pallas, waning but still in effect. 4. 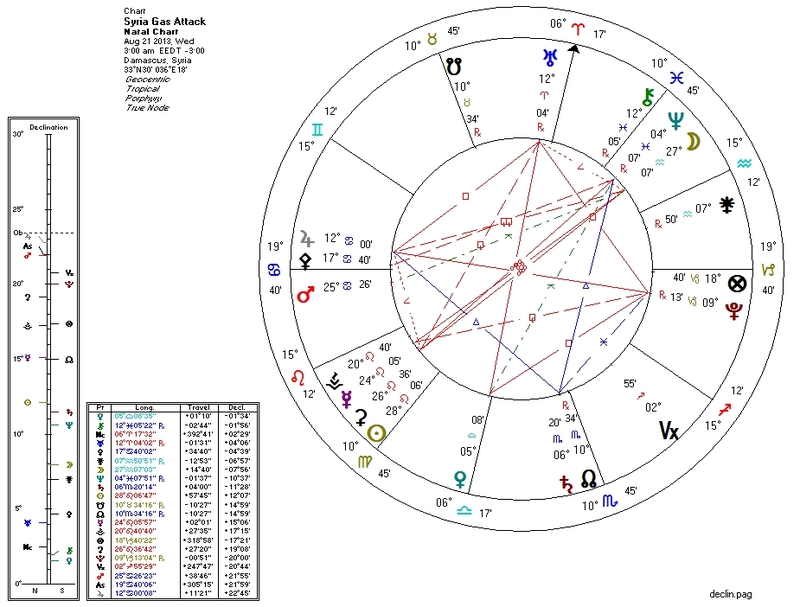 Pluto square Uranus, sextile Saturn, and opposite Jupiter: possible rulers of the Moon. 5. Pluto sesquiquadrate Mercury, which is conjunct Sun.